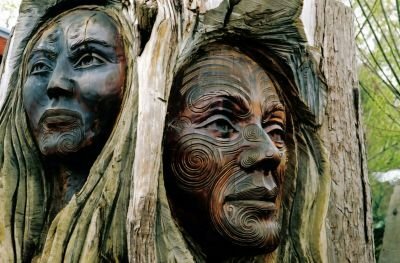 Faces carved into a tree trunk by a Maori artist. Lifelike, aren’t they? Note the tattoos on the man’s face to the right – tattoos, of course, are a big part of Polynesian culture, as we mentioned in our newsletter a couple of years back. This entry was posted	on Friday 30 November 2012 at 13:08	and is filed under 2012, New Zealand. You can follow any responses to this entry through the RSS 2.0 feed. You can leave a response, or trackback from your own site.